Of Syria's estimated 10 million children, 8.6 million are now in dire need of assistance, up from about half a million after the first year of war. Nearly 6 million children are displaced or living as refugees, and about 2.5 million are out of school. BEIRUT (AP) — After seven years of war in Syria, the United Nations has one thing to say: Stop the war on children. Of Syria’s estimated 10 million children, 8.6 million are now in dire need of assistance, up from about half a million after the first year of war. Nearly 6 million children are displaced or living as refugees, and about 2.5 million are out of school. Over 3 million children are exposed to the hazards of unexploded ordinance and land mines, even in areas where the conflict has died down. Some 40 percent of those killed by land mines are children. While the U.N. has verified about 2,500 children killed between 2014 and 2017, it says the actual numbers are far higher. The Britain-based Syrian Observatory for Human Rights, which has tracked the war since it began, has documented as many as 19,800 children killed since the conflict began in March 2011. A study published in the Lancet in January shows that children are increasingly bearing the brunt of the fighting, making up 23 percent of the civilian casualties in 2016, compared to 8.9 percent in 2011. The Lancet study reported at least 13,800 children have been killed from 2011 through 2016. And in the first two months of 2018, more than 1,000 children have been killed or injured, according to the U.N.
And despite moves to establish “de-escalation” zones by the parties to the conflict, the violence has only worsened. Nearly 400,000 of civilians are trapped in the rebel-held Damascus suburbs of eastern Ghouta as the government and allied forces wage a relentless bombing and shelling campaign to retake the area. Save the Children, in a report issued on Monday, said that its partners on the ground have described an “apocalyptic” bombing campaign that has targeted homes, more than 60 schools, 24 hospitals and other medical facilities and forced thousands to live in underground shelters. Further north, hundreds of thousands in the Kurdish district of Afrin are also squeezed amid a Turkish offensive to expel a U.S.-backed local Kurdish militia. “For hundreds of thousands of children in Syria, this is the worst point of the conflict so far,” Save the Children said in its report. In its report, Save the Children said the number of people displaced has grown by 60 percent since the de-escalation zones were announced last July, with up to 250 children fleeing their homes every hour. 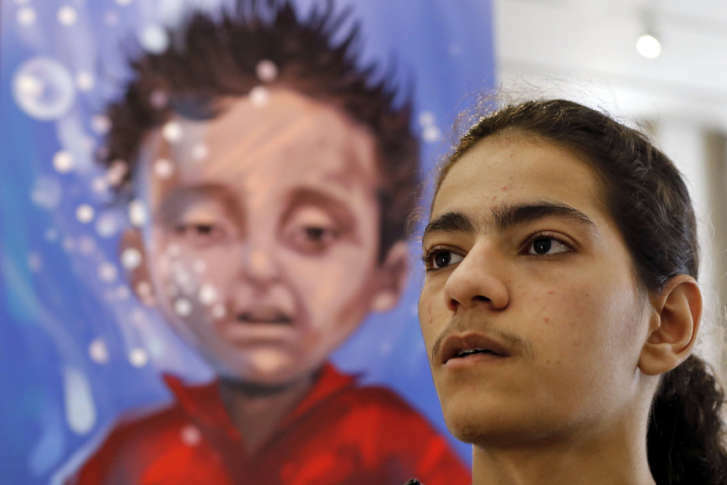 In a reminder of the horrific toll of Syria’s civil war, an exhibit in Beirut of poetry written by Syrian refugee children and illustrated by Lebanese and Syrian artists captured the pain the children grapple with. Ola Mohammed, an 11-year-old girl from the province Rif near Damascus, seemed haunted by images of Aylan Kurdi, a 3-year-old Syrian boy whose body was washed ashore in Turkey in 2016 after the boat he and his parents were fleeing in capsized and came to represent the horrific toll of Syria’s civil war. “I blame you, oh Sea — Why did you swallow my friend?” she wrote. Noting that during seven years of war, not a single party to the conflict has shown any respect for the “sacred principle of protection of children,” Cappelaere said that he fears for the future of Syria. “However, when I speak to the — boys and girls and hear their dreams and aspirations and what they want to become in life and when I hear their resilience and their determination to fight for a better, brighter future I do very much believe that Syria has a future ahead,” he said. At a conference Monday organized by UNICEF in Beirut, Bassel Mokdad, a 17-year old paralyzed from the waist down by an injury he suffered in Syria’s southern Daraa province in 2013, performed on his violin for an audience of mostly journalists. Mokdad, who now uses a wheelchair, said after fighting depression and a brief period of self-imposed isolation following his injury, he decided to embrace the future and find a goal. If he can’t make a musical career, he will try photography, he said.